Attack on Pearl Harbor illustrates a famous historical story of the surprise attack of Japanese air forces on United States Pearl Harbor naval base in the era of the second world war. 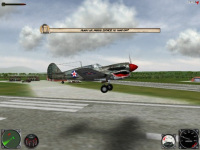 This game is more focused on air combat than the realism of aircraft simulation so that controlling the plane feels very easy to do. Playing the plane is done using mouse only. Gun shots are also performed by clicking the left and right mouse buttons. Player can choose to play either on American side or on Japanese side. If US campaign is chosen, player will concentrate on attacking and destroying Japanese aircrafts that come from west direction. Otherwise, if Japanese Campaign is chosen, player is given the objectives to bomb the anti-aircraft defenses and the control towers around naval base Pearl Harbor Hawaii. Race MotoGP at Sepang circuit in 3D racing game with nice graphics. Feel the adrenalin of playing off-road motorcycle racing. Enjoy playing Fifa 2005 Demo - 3D footbal game by Electronic Arts.